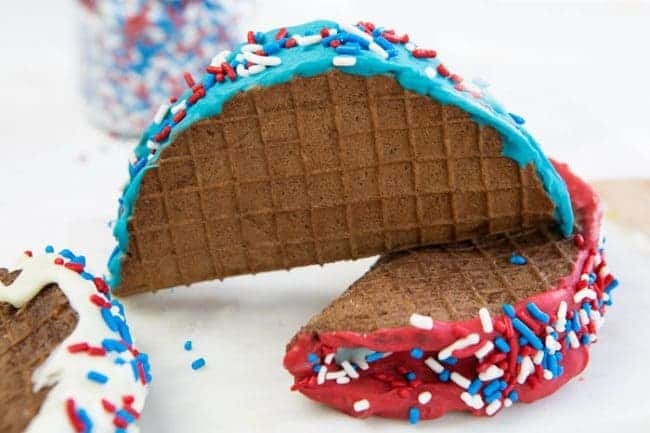 My family absolutely loves these Patriotic Chocolate Tacos! The best part? 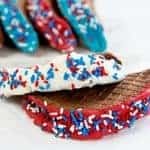 You can make this fun ice cream treat ahead of time and serve at your 4th if July celebration! 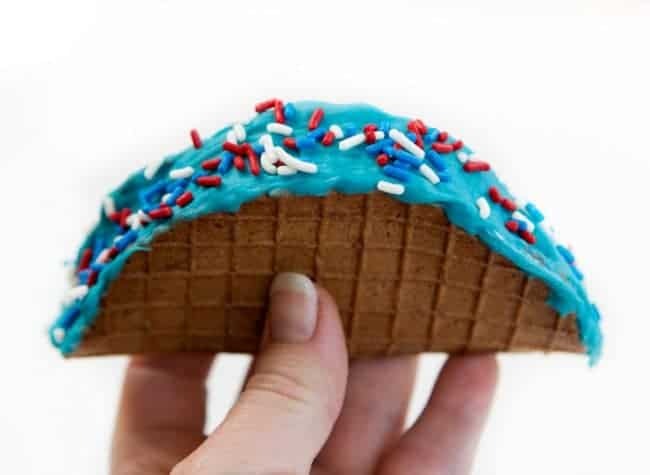 These chocolate tacos are actually pretty easy to assemble! The part that is a bit trickier is the timing. There is a lot of freezing and steps in between freezing and that can have you tied to your kitchen for a couple hours. 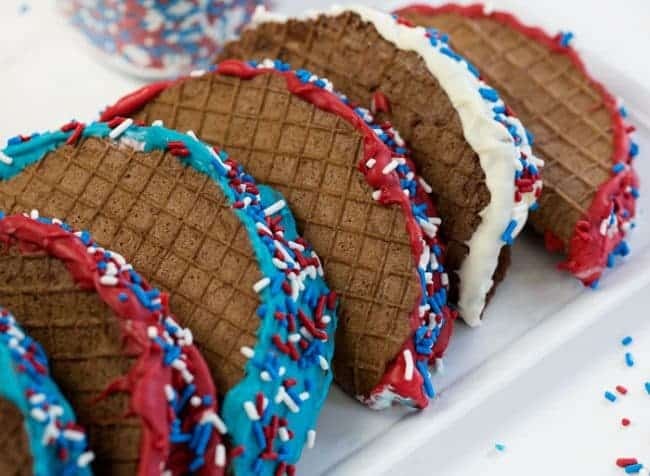 But the result is worth it when you show friends and family your homemade Patriotic Chocolate Tacos! 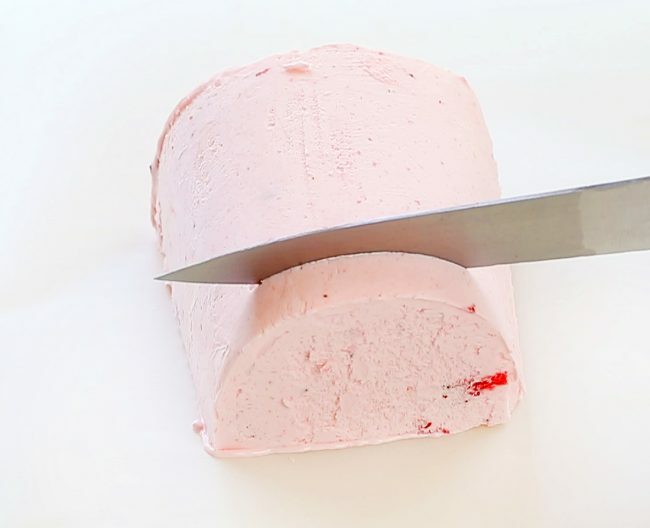 Start by setting out your ice cream to thaw for about 30 minutes. (I used ice cream in an oval container when I saw Ashlee Marie do that for her gorgeous Chocolate Tacos) Use a sharp knife and run it around the edges of the container to remove ice cream. Set ice cream on a parchment lined cookie sheet and cut off 1/3 of the end. Now lay that end on it’s longest side and cut into smaller pieces, less than 1 inch thick. 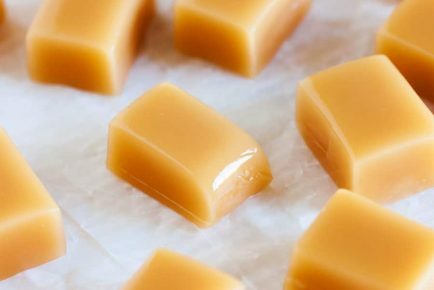 Lay those pieces flat on the parchment and freeze for at least 30 minutes, preferably 2 hours. Add all ingredients to a bowl and stir until fully incorporated. Add all the chocolate waffle ingredients together in a medium bowl and mix until fully incorporated. Cook for approximately 1 minute, or until machine says they are ready. Fill chocolate shells as soon as possible as they will harden after about 60 seconds. 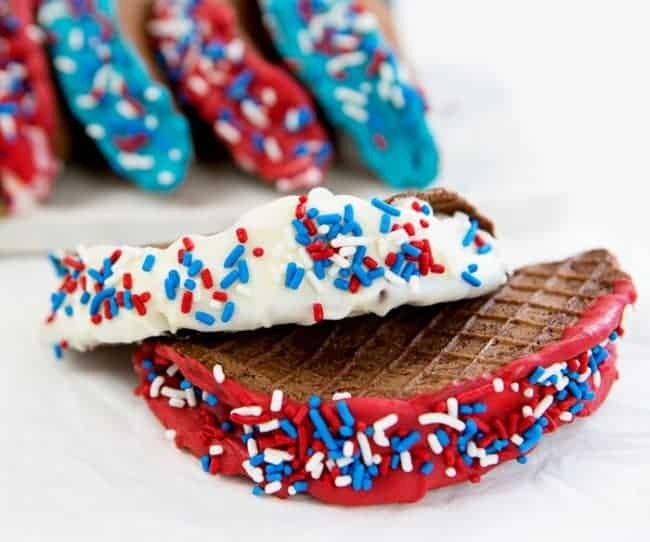 After you have made one chocolate taco, use a small offset spatula to carefully remove the hot waffle cone and place one of the frozen ice cream half circles onto it. Press chocolate taco together and refreeze. It’s best to only do a few a at a time and then get the assembled taco back into the freezer. If the ice cream melts too much, the tacos could get soggy. Melt the chocolate wafers according to package instructions and let cool slightly. Dip the open ice cream side of the taco into the chocolate, covering all the exposed ice cream. You can use a small offset spatula to fill in any spots that didn’t get covered. 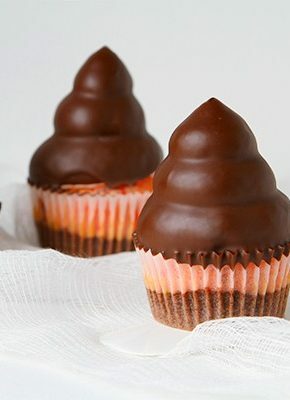 Immediately cover the chocolate with sprinkles. Keep frozen until you are ready to serve. 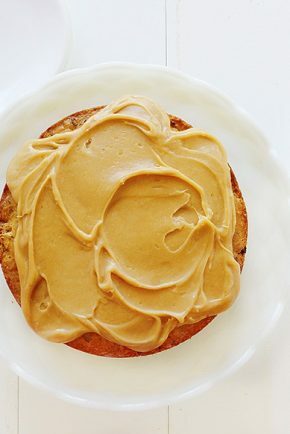 Make sure you have time and freezer space for the cookie sheets. The tacos have quite a few freezing steps. You can use any flavor ice cream you want! I chose Blue Bunny Blue ice cream, strawberry, and vanilla. Chocolate would also be amazing! 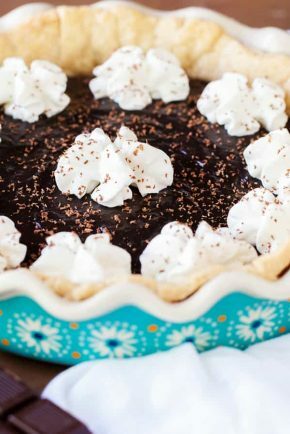 You can also use semi-sweet chocolate in place of the red, white, and blue chocolate. 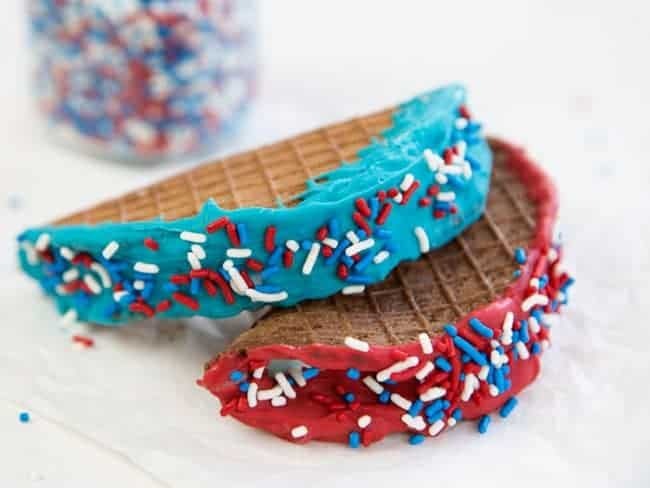 When paired with the patriotic sprinkles it will still be very festive! If you can’t find oval-shaped ice cream containers you can fill the chocolate shells with a spoon. You will want to prepare the shells and then mold them with a taco shell holder (or on the back of a book) and allow to harden. Once shells have hardened, hold it in your hand and scoop some softened ice cream into the shell. 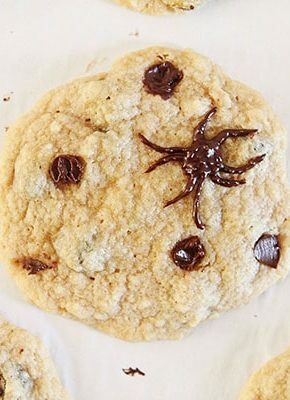 Place on a parchment lined cookie sheet and decorate as directed above. Having the kids help with the chocolate and sprinkles is one fo the best parts! They love seeing these come together and love being able to tell friends and family that they made them! How many tacos do you get from the recipe? Love this idea! 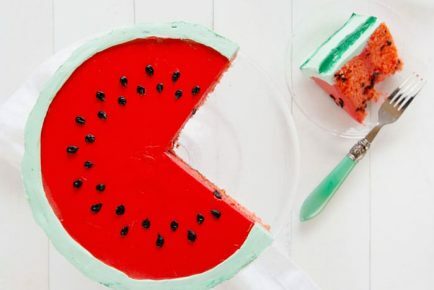 I will try it for our next party! thank you for sharing! Hi Amanda, I’m Nausheen from pakistan, you are amazing baker, I learn many things from your recipes.